If there is one thing that is predictable with my meals, it is my breakfast. Steel cut oatmeal with fruit and protein powder. Lately, I’ve been eating it with Vega, since I scored it at half price. Making a big batch each week is a time saver and doesn’t make me think too much each morning as I rush out the door. With a bit of extra time this long weekend, I decided to host a birthday/housewarming brunch today. A time to whip out all the vegan brunch options. I know, one meal that can be challenging for vegans has got to be brunch, typically filled with cheese, eggs and baked goods. Not here. 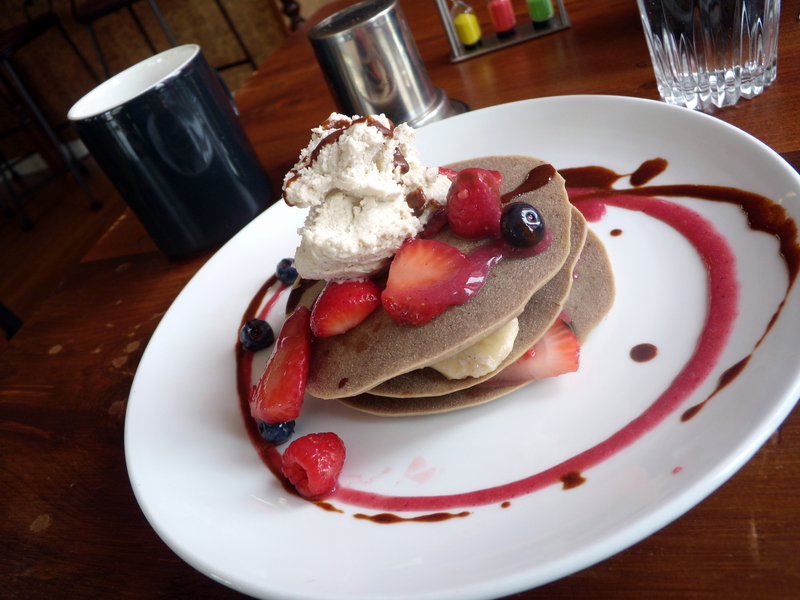 A recent visit to The Naked Sprout‘s Sunday brunch had me in a tizzy over their raw raspberry banana coconut pancakes with coconut ice cream. I thought it would be great to try my hand at it and I figured going raw for brunch would be an easy way to serve a crowd. The pancakes could be made in advance and then assembled once we were ready to eat. No need to slave over a stovetop, especially during this hot summer weather. Of course, I had to do some research to make sure the recipe worked out before my guests arrived. Last week, while we still had strawberries, I did the first test run. This was the glorious result. 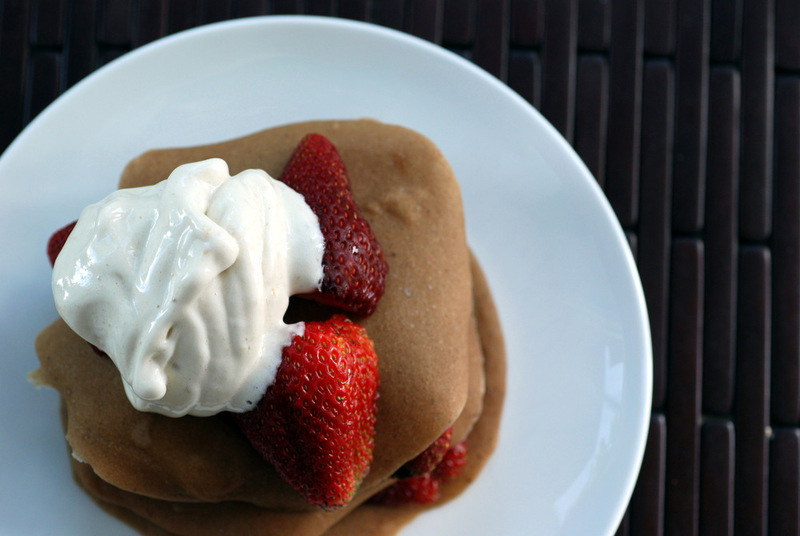 Soft and chewy (not light and fluffy like SAD pancakes) pancakes with a hint of maca. Stacked, on top of berries and topped with banana soft-serve ice cream. I was definitely inspired by my meal at The Naked Sprout. This version was lighter and glorious in the melting ice cream. Make no mistake, their vanilla coconut ice cream was possibly the best I have ever had. One problem: A few days later, my pancakes didn’t look the same. I stored a bunch in the refrigerator in anticipation of not dehydrating this weekend and they turned brown. The banana had probably oxidized or something. Still delicious, they just weren’t as um, photogenic. Well, at least to me, since I know they are supposed to be a light brown colour. In any case, strawberries are out and cherries are in, so I’ve come up with an alternate breakfast plan. Stayed tuned! This is being submitted to this month’s Breakfast Club featuring holiday treats, to this week’s potluck party for raw foods, to this week’s Weekend Wellness and to this month‘s Simple and in Season. 1. In a blender or food processor, combine the banana, buckwheat flour, maca and almond milk until smooth. Add in the flax meal and quickly blend until smooth. The batter should be fairly loose and similar to regular pancake batter. 2. Using a 1/4 cup measurement, pour 1/4 cup spoonfuls of the batter onto a Teflex lined dehydrator tray. Smooth into a small circle, around 5″ in diameter or 1/2-cm thick. You should get about 5 pancakes. 3. Dehydrate at 105F for 6-7 hours, or until you can peel the pancakes off the Teflex sheets. Flip and dehydrate for another 1.5-2 hours, until both sides are dry to the touch. Do not over-dehydrate, otherwise you will lose the softness in the pancakes. Check often. 4. Once you are ready to serve your pancakes, make your banana ice cream. Place the frozen banana chunks in a food processor fitted with its S-blade and whip until smooth (this may take 3-4 minutes, and test the ability of your food processor). You may need to scrape the sides a few times, be patient. 5. 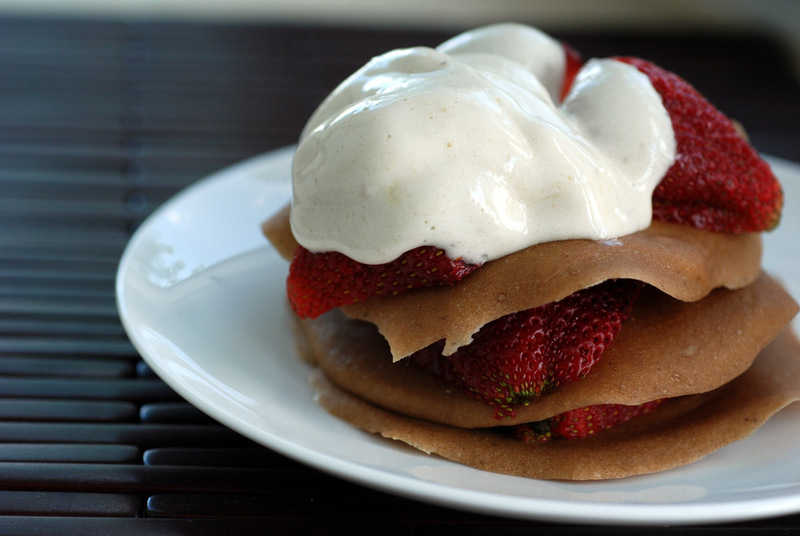 Make a pancake stack, with strawberries in the middle and top with the fresh banana ice cream. Delicious warm straight from the dehydrator. Unadorned pancakes can be stored in the fridge or freezer, although in the fridge they may turn a darker shade of brown. Should be ok if stored for a day, I think. I’ve been eagerly anticipating these and they look so good! I’ve never had raw pancakes before, I’m so curious! I love the simple ingredients too. Will have to try these! What a fabulous vegan breakfast/brunch dish. Now I need to find out what Maca is! The whole dish looks amazing and so good for you. Love your ideas! Based on your description it sounds like I’d LOVE the texture of these. Don’t get me wrong, fluffy pancakes are awesome…but there’s something to be said for thinner denser ones also! This is so delicious. I love the preparation of this pancake. I am sure I commented but no sign of it! What an amazing first entry to Breakfast Club! Delcious and so so healthy. As ever beautiful photos!